Experience an incredible mountain top dining experience with live entertainment. Ride up Whistler Mountain in the Whistler Village Gondola and enjoy mouth-watering food, fresh salads and delicious desserts at 6000 ft. Whether you dine inside or on the scenic patio it’s great for the whole family. Times: First seating at 5:30 PM, second seating at 6 PM, third seating at 6:30 PM. Last download at 8 PM. Pricing: Includes a delicious meal and a PEAK 2 PEAK Alpine Experience ticket. Ride the PEAK 2 PEAK Gondola and access alpine hiking trails during the day of the feast. Please note the PEAK 2 PEAK Gondola closes for sightseeing at 5 PM. Already have a PEAK 2 PEAK Gondola ticket or season pass? Tots are Free! Children 4 and under are free when accompanied by an adult. Ticket provides full access to on-mountain sightseeing for the day and the PEAK 2 PEAK Gondola. Children, Youth and Senior rates available. Already have a PEAK 2 PEAK Gondola ticket? Add on the Mountain Top Summer Feast starting from $47 per person. 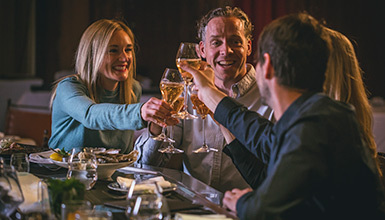 Winemaker's Dinners are at the Roundhouse Lodge atop Whistler Mountain, featuring British Columbia’s best wines paired with locally-sourced culinary delights. The evening includes a five-course dinner paired with five glasses of wine and incredible views over the mountains surrounding Whistler. It's guaranteed to be a feast for the senses. Check back regularly for more information on upcoming events. Perched on Whistler Mountain, the Roundhouse Lodge offers a variety of food from West Coast Grill to made-to-order sandwiches and salads. Riders in the Whistler Bike Park and visitors looking for a unique sightseeing experience can upload the Whistler Creekside Gondola to the Raven's Nest. This restaurant offers delicious vegetarian and vegan meals along with coffee, beer and a sunny patio with spectacular views south of the village. Take a break from your hike at our classic alpine tea hut on Whistler Mountain. Refuel with cold drinks, snacks and our famous fresh scones. The Harmony Hut opens for summer with the opening of the hiking trails. 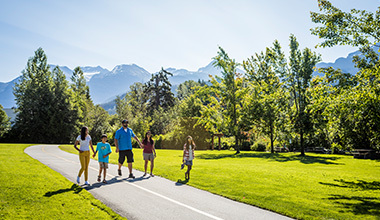 This natural resting place on Blackcomb Mountain offers many lunch options including a full service sandwich and salad deli, cappuccino bar and sunny day patio grilling. Indulge your appetite and culinary senses with Whistler’s only alpine full service dining experience. Featuring classic dishes with incredible views and ample patio seating. Try a sampling of international and local wines with the new wine flight options. Located inside the Rendezvous Lodge and open for lunch, call 604.938.7437 for reservations. From casual bites and taster flights to champagne nights - the Insider has all you need to know about planning your culinary adventure.